Service 29/A: The service 29 and 29A will operate a combined 15 minute service between City Centre, St Budeaux and West Park, with the service 29 operating every 30 minutes to Transit Way and Derriford Hospital and the 29A operating every 30 minute to Ringmore Way and Holly Park. Withdrawn. Passengers for West Park, Crownhill and Derriford Hospital will need to change buses at St Budeaux to the service 29. The withdrawal of the 30 means the end of the direct link between Saltash and Derriford Hospital. 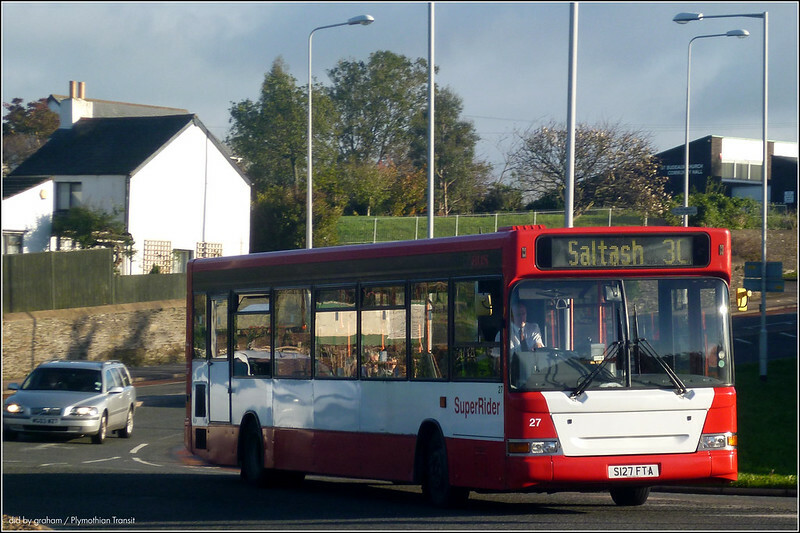 This link started many years ago as the 52 between Saltash and Plympton. This service will now serve Durnford Street and Royal William Yard, with an increase in number of journeys between Stoke Village and Derriford Hospital in the mornings. Additional service due to arrive at the City Centre at 06:14 Monday to Friday. Inbound service will return to using Mayflower Street and Western Approach terminating at Royal Parade. This is to improve service reliability. This service will continue to operate increased running times on School Days during peak times to help with traffic problems at Manadon Roundabout. Services will now terminate at Royal Parade. Travel between City Centre and Royal William Yard provided by service 34. This service will operate increased running times on School Days during peak times to help with traffic problems at Manadon Roundabout. Service 43: Evening service times changed to interwork better with service 5/A between St Budeaux and City Centre terminating at Royal Parade. Due to changes in traffic movements since September 2013 it now takes longer to travel between Crownhill and Mutley Plain during busy times of the day. To adjust for this Services 40, 41, 42/A and 44 have each been given additional journey times put in during peak times on school days these changes have had a detrimental effect on some early morning and mid evening journeys. Service 61/62: Service 61 will operate every 30 minutes to Peverell, Cherry Tree then St Pancras Avenue, Honicknowle, West Park, Transit Way, Break Farm, Spring Hill, Cherry Tree and Peverell to the City Centre. Service 62 will operate the reverse of the 61 route every 30 minutes. Service 61A: Withdrawn and replaced with 29A between City Centre and Holly Park. Abandoned Mail Rail to open for tours One step closer to taking a trip in a curious little train under the streets of London after Islington Council approved an application to open up the Mail Rail to the general public. The union leader everyone had heard of Bob Crow, who has died at the age of 52, was an intensely divisive figure. But he was easily the best-known trade unionist in the UK. First would be long gone and GoAhead would have the city tot themselves if they hadn't been so silly to register over Torpoint and Tavistock instead of completing their deal to buy the two corridors. Older vehicles can operate quite happily when regular maintenance is undertaken. Buses have to have an MOT test equivalent inspection every 4 to 6 weeks (Stagecoach do their fleet every 21 days or 3 weeks) and if vehicles fall below the standard, VOSA take an interest and prohibitions get issued. As I've not heard about First Devon & Cornwall having a maintenance related Public Inquiry since 2006, I'd suggest First are operating a legally safe fleet on the streets. Don't forget too that old buses aren't going to cost the company money like a new bus will - lots of bums on seats to pay the cost of the vehicle, which you spread over time. Citybus have to generate lots of revenue to ensure their expensive new buses (all of which look very nice and are very visible signs of interest from up top), whereas First's fleet costs them nothing aside from their maintenance costs. They don't need to generate massive returns, and so they are able to disrupt Citybus' revenues, which I'd say, from outside observation they are doing very well at. a) It's a shame that First don't pay the same attention to the shabby interiors of their buses as they do to the oily bits, then. 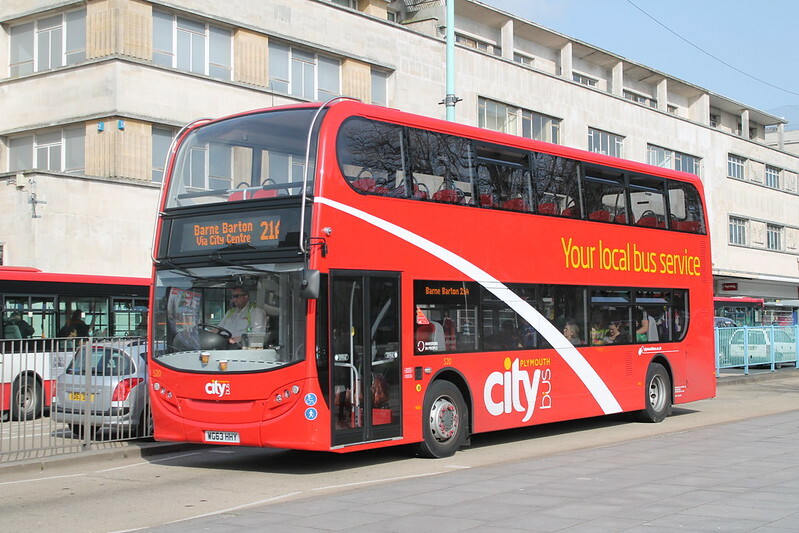 b) So you don't expect a quality, reputable operator like Plymouth Citybus to buy any new buses, then? If no-one bought any new buses, there'd be none to cascade or buy second-hand. Twenty new deckers and ten new B7RLEs in five years is hardly pushing the boat out, is it? In fact, it's probably about half of what they should be buying unless they really want to keep shipping in batches of 12 year old ex-London buses every so often. a) First have to comply with VOSA standards and submit the vehicles for an equivalent MOT every 4 to 6 weeks. It'd be interesting to know if they employ bus cleaners at their depot, most companies do have them. I stand by my comment that engineering standards aren't below the requirement as FDC has not had a maintenance related PI since 2006.
b) You make a valid point in the numbers of new buses. My point is where PCB has chosen to place the new vehicles. Rather than place them on established services which should on paper provide more than adequate revenues to pay for themselves, they've elected to place the brand new stuff on unproven routes which have no firm revenues (aside from their budgeted projections) to ensure they contribute back to the business. It'd be a better option, for PCB to provide mid life Citaro single decks, suitably refurbished or Enviro 200s, suitably refurbished for new competitive services. That way, the vehicles you operate will cost you less in financial terms, and will achieve the same result. If after 2-3 years of the service, demand is increasing, then you can make a better case for brand new double decks because you have all this growth. 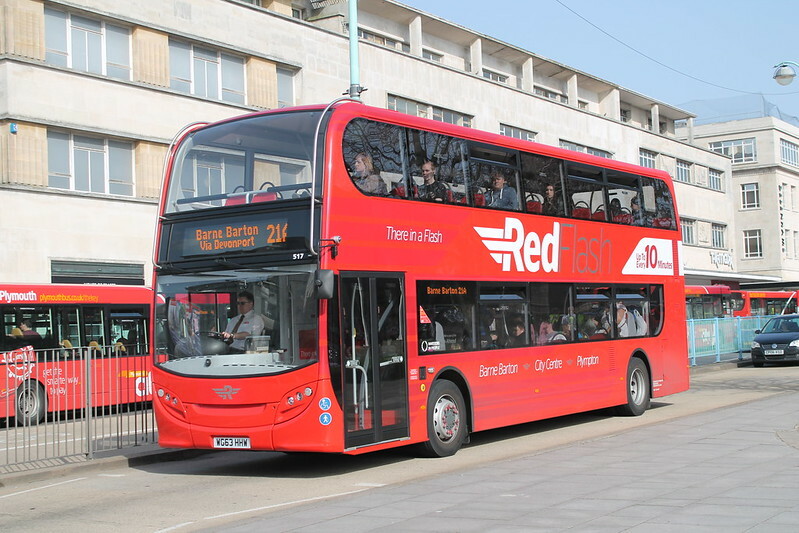 In turn, placing slightly older buses on a new service reduces the exposure for the business, as you've not sunk in brand new vehicles for their first few years of use. I welcome PCBs investment in quality kit, but do wonder why it's been put on a competitive route, when the investment is better used and more visible on the core city routes which apparently are PCBs bread and butter and what it should be doing best. In not placing the investment on the 'killer' routes where they have a monopoly it sends a message to the customer. You make a good point but of course 16 of the 20 new DDs are on a proven city route - the 21 21A. Only 4 of them are on the Blue Flash so its not so much of a gamble really. They can of course be moved back onto a city route at any time if it was felt they were wasted on the 12. Hopefully these first 20 will be followed by more this year so more city passengers will benefit. Thanks for that Graham, seems a tad more sensible. Although, assuming a £200k per bus figure, that is around 7-800k sunk into an unproven route, with 4 brand new buses that overall could be deployed elsewhere. Far better to put in older Citaro buses, suitably refurbed (which are decent vehicles even though they are between 8-9 years old), add some Northern Irish plates to hide the age, and the customers will think it is a brand new bus. The second batch of Citaro's would appear 'new' even now, if some attention was given to them and they'd outwardly not look their 8-9 years of age. They're halfway along their useful life, in financial terms, and ideal for developing a competitive route to the point where new buses would be a nice upgrade a few years in. As I said originally, the investment is welcome and much needed but is it put in the right location to generate the revenue? If I was making these decisions, I'd seek to reduce the exposure to my business, in the way I've been taught by previous employers, who had the lovely problem of managing runaway growth with resulting double figure profit margins for the business. In turn it caused new vehicle investment once the routes became established - with frequencies driving upwards and further vehicles having to be bought in - in two instances seeing an whole route being replaced with around 20ish new vehicles. 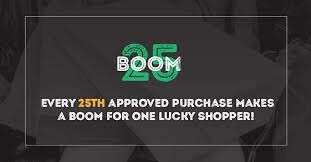 But it was started cautiously, using cheaper, mid life vehicles in order to reduce the financial burden to the business and meaning if it didn't work, then the costs borne were lower. Anon 19:56 - it's all in the accounting. There's many different ways of crunching the numbers. None of it really matters..... overall the fleet is out there, earning money and the end result is much the same. If the four new deckers are being depreciated against earnings on the 12, then yes, it may make that route look less profitable than if it had mid-life vehicles. On the other hand, as a direct consequence, there's another route out there (a 'bread and butter' route if you like) that's running four mid-life buses with less depreciation and therefore showing more 'profit' than if it had the four brand new buses. It's all swings and roundabouts. I never made any comment on First's engineering standards whatsoever. I just said that I wished they'd look after the bus interiors a little better than traditionally they have, as mis-matched seat cushions and threadbare moquette is not exactly inviting to passengers. Anon at 22:26 has to appreciate that the Tavistock route is highly competitive, it's not just been launched over unserved roads. Citybus clearly (and rightly) want to use new quality vehicles to be able to trump any retaliation that First might have made. As it is, it caused First to move their own (slightly older) Enivro 400s onto the route (which Citybus had probably predicted). If you're going to compete seriously you have to use the right equipment and be better than your competitor in all departments. Then you might even be able to charge more! Presumably Tavistock is seen as a better opportunity than Torpoint as both operators use mid-life vehicles on that, although First has little choice unless they invest in the business and ship in newer buses from elsewhere in the country (at which time Citybus could simply rejig the allocation of their existing fleet to retaliate). At some point First is simply going to have to spend dosh on modernising their fleet. It's difficult to see how that money can be generated, though, especially with Tavistock and Torpoint revenues now split across two operators. 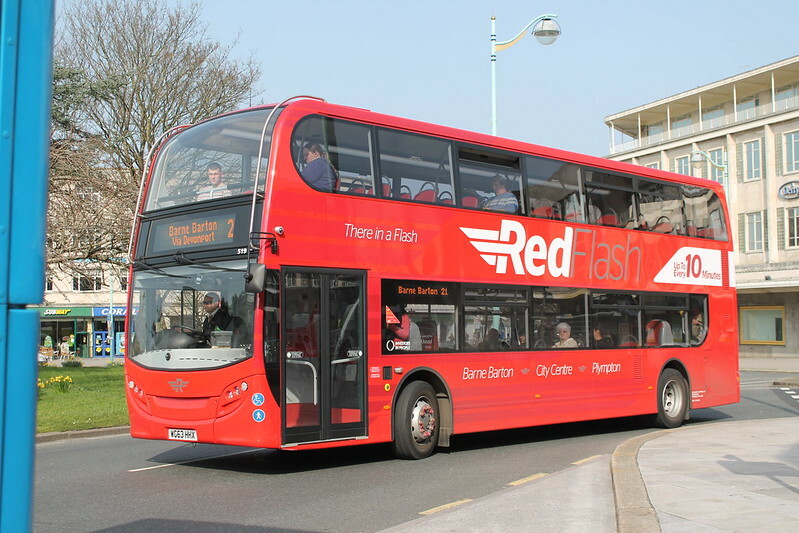 Plymouth Citybus are heading to Okehampton! Other Details: Sundays and Bank Holidays except Christmas Day, Boxing Day and New Years Day. 2 Journeys in each direction. Quite surprised with these being a lot of a beacon bus routes, and that Plymouth Citybus are going as far as Barnstaple! Only the M-Sat service 118 from Barnstaple to Okehampton will remain with Beacon Bus when this begins. Rather an interesting choice of new route for Citybus - it isn't like the old 86 carried lots of people north of Tavistock to Okehampton when First operated it with modern low floor buses, for 11-12 years before throwing it in. The real problem is that most of the residents along the route don't have bus passes, and have free transport provided for them by their owners/keepers, either in an Ifor Williams trailer hooked up to the Farmer's Land Rover, alternatively they travel in a cattle truck or a horsebox. They are not picking on anybody. These are services put up for tender by the local authority who decide who operates what. Any operator that meets the requirements can put in for them. In this case Plymouth Citybus won. At the same time it gives operators like Jacketts chance to run services in Plymouth like the 13 and the 52 and now the 25 on Sundays. Are Jacketts picking on Citybus? No - its called fair competition. Cant understand the logic that they cant operate to Barnstaple if they are called Plymouth Citybus. First are quite clearly Second in Plymouth Stagecoach are not pulled by horses and Jacketts drivers dont always wear jackets - the name isnt important! Fares on tendered services are usually dictated by the local authority. Has Devon re-tendered the 118 service then? Cleaarly there are still a few out there who truly believe what they read on the side of the bus> Plymouth Citybus are NOT and have not been since Go Ahead took over, YOUR LOCAL BUS COMPANY. In the same way that First are not Western National. It is only a clever marketing tool which happens to convince the odd one or two. All transport companies are essentially the same animals in different coloured skins. All bus companies in the Go Ahead Group operate autonomously unlike First so they ARE Plymouth's local bus company. PCB is local but registered office is Newcastle, Chief Exec in London, the real decisions made in Poole by the Finance Director, shared with Go South Coast. If these decisions are indeed local, and PCB has commercially registered between Okehampton and Tavistock, then I think we shall see a new advert for an MD appearing within 18 months as financial targets become unmet. Remember the profit target for all the group companies to meet. I cannot see how any of what PCB is doing will allow them to achieve this. Go Ahead is rapidly becoming centralised, - local MDs have less power, witness Roger French's retirement from Brighton because of this. If PCB has tendered for Okehampton to Tavistock, how come they are cheaper than the cheapest operator in the county on tenders, whom no one can undercut as they always bid below cost? Or is another plank of the GA strategy to remove ALL competition from the area then shove the prices up? Devon County Council do set the fares on the services they put out to tender - although, if it is an evenings and Sundays addition to a daytime commercial service, I think they allow the operator to use the same faretables. I don’t know of any services in Devon with the daytime service being run commercially by one operator but the e/Su tender being run by a different one. This did happen in Cornwall on the 76 until First took the e/Su contract from Western Greyhound backalong. I don’t think Cornwall Council do lay down fares - they are more inclined to let the operators do things their way provided the service is run properly. They also seem far more willing to discuss route and timetable with an operator rather than laying this down in County Hall. There is another way to get round having 'Plymouth Citybus' in Okehamppton and Barneatple. I scent a Green Flash' coming on. Have they got some nice new single-deckers on the way? It will be interesting now if they go for the 76 tender whenever that one comes up again. If they can go to Barnstaple, then they can go to Bude. Watch out for Orange Flash!